Food trips are inextricably tied to travel where Tutubi tries to sample unique specialties and delicacies of all places he visits. Take kilawin for instance, a truly Filipino dish, simple and devoid of foreign incluences, even if similar to cerviche except the use of vinegar and not lemon. 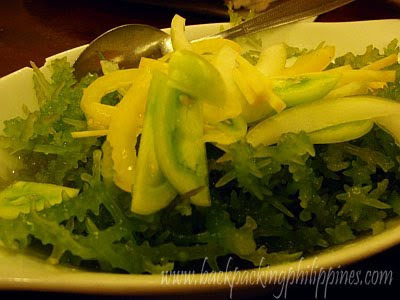 This post features two versions of kilawin recipes with meat or fish replaced with ingredients from under the sea: seaweeds. 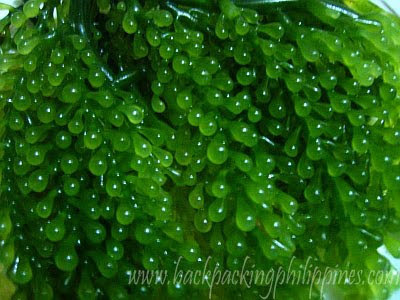 There are five seaweed species in the Philippines: Guso (Eucheuma), Lato (Caulerpa), Sargassum, Gelidiella and Gracilaria of which the first two are the most popular. They're now cultivated in shore communities and exported raw or processed with a little salt. Lato resembles small green grapes, translucent with smooth texture and bursts with mild salty flavor once eaten then glides down your mouth. It's mostly prepared kilaw-style i.e. mixed with vinegar and usual kinilaw ingredients used in the particular place. Kinilaw na Guso, first encountered by Tutubi in Leyte, is actually agar-agar (scientific name: Eucheuma denticulatam) the source of carageenan used in food processing and other products such as toothpaste. Appearing like tree branches, guso, also has green color and texture different from lato. Tutubi prefers this over lato. The third interesting "seaweed" recently featured on GMA7's Kapuso Mo Jessica Soho, that Tutubi has really yet to taste, is called lukot and actually not a seaweed at all. Lukot are excretions of the dongsul or sea hare and resembles green spaghetti, gathered by people near beaches where the sea hares live. Tutubi hopes to see and taste lukot one of these days in future trips down south. Should any reader knows where to buy lukot in Metro Manila, please lead Tutubi there. It may be another exotic food trip in the offing. I love seaweed salad, but not the seaweed you featured here. I don't know which one it is, but it's good. love seaweed salad.never seen lato before but I remember the brownish seaweed kilawin ( forgot the name) dish from Negros. Dang, it's been years. I miss it a lot. nakakain na ako ng lato but im not sure if i already tried lukot. few weeks ago, napanood ko sa tv ang tungkol dito. parang gusto ko rin tikman. that second photo looks mouth-watering! only tried lato and i so loved it! kelan kaya uli ako makakatikim? may i know where can buy the dried type guso? plz email me at luvkennie@hotmail.com thanks!